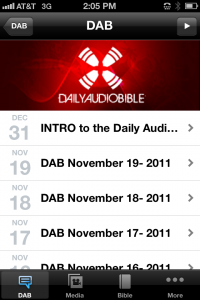 Listening to the Daily Audio Bible (DAB) podcast is not a way to do in depth study but it is a consistent everyday meal of scriptures. It’s a healthy habit for me to listen to it during sleepless nights, early mornings, or drive times. I like to read along whenever possible. 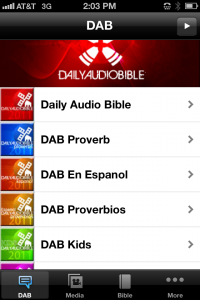 Daily Audio Bible (DAB) – This is the hallmark podcast and my favorite in the family. It includes a portion of Old Testament, New Testament, Psalms, and Proverbs each day by using the ‘One Year ® Bible’ reading plan. I like to couple the audio with reading the bible via the Youversion App which I previously reviewed. The ‘English’ version narrator, Brian Hardin, introduces books of the bible with brief background information and often interjects brief, amusing, yet insightful comments. If you have friends or family who don’t speak English they may enjoy the Spanish, Chinese, Japanese and Hindi versions. DAB Proverb – Includes one of the 31 Proverbs each day. You have to love the wisdom that is packed in a few short minutes. I’ve listened to this podcast for several years via the iPhone’s podcast subscriptions for free, however, they recently released a $.99 app which I purchased for this review. It lends easy access to audio content as well as the corresponding text. If you’ve ever had an inclination to get through the bible in a year this may become your favorite podcast. It’s a great idea for a ‘new year’ activity to enjoy with a friend or family member. Let me know if you’d like to partner with me in reading/listening to the bible in 2012! Check out the website at www.dailyaudiobible.org. Merry Christmas and a scripture filled New Year! Thanks for the Great information. I have listened to the DAB in the past but had not thought of it for my kids. Will definately see about this! it is funny how you mention Christmas song, one of my Favorites is White Christmas…just love the movie by the same name too. The kids are ‘hounding’ me to watch it..maybe this weekend!